The based in Bulgaria’ second largest city of Plovdiv “Galaxy Property Group”, which is the manufacturer of alcohol beverages under the brand “Peshtera”, is claiming ownership of one of the most lucrative properties in downtown Sofia on the central “Dondukov” Blvd. At this address, however, there is a building that prevents the Plovdiv businessmen’s profits from the expensive property. The building is a historical monument. It is the “Madara” printing house of Gen. Racho Petrov, two-time Prime Minister of Bulgaria. Atanas Petrov and Anton Shterev, known as the “Peshtera Boys” have, to put it mildly, a complex relationship with law enforcement authorities. We recall that a former boss from the Main Directorate for Combating Organized Crime (GDBOP) was negotiating with them obtaining an expensive rifle and a laptop against providing cover-up for their alcohol beverages without excise labels. More recently, the associated with them company “Kings Tobacco” was mentioned in a series of reports as the main source of smuggled cigarettes in Bulgaria. Despite the seriousness of these allegations, there is no prosecution. 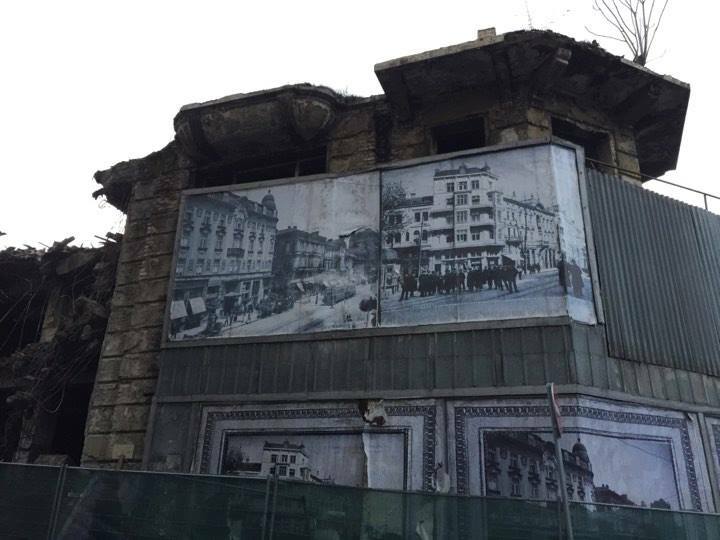 In the case of the building on 20 “Dondukov” Blvd., no other but the Sofia Municipality is stepping in to help these “honest” Plovdiv businessmen by securing the demolition of the printing house without taking into account the fact that this building is designated as a “monument of culture”. Earnestly and in the dark, on Christmas Eve 2017, the excavators attacked the building. It remains unknown who sent them, who paid the company and ordered its staff to work on an official holiday. What is known is that the Ministry of Culture would have irretrievably missed the demolition of the building it is responsible for, if it had not been reminded of its status by… vigilant citizens. The Inspectorate at the Ministry temporarily halted the demolition activities pending a probe into the case, and Sofia Mayor Iordanka Fandakova promised a new examination of relevant documents. Similarly, on a Sunday in March 2016, the demolition of the Plovdiv tobacco warehouses was started. They also turned out to be a monument of culture and a scandal erupted. The owner was even charged by the prosecutor’s office. The Chief Architect of Plovdiv, Rumen Russev, who allowed the demolition, might be facing a jail sentence. It is remarkable that in their coverage of the demolition of a property that should be protected by the State, no media mentioned the interests of the “Peshtera Boys”. Bivol, however, has been monitoring the case with the building on 20 “Dondukov” Blvd. for months, and conducted a parallel inspection that revealed many disturbing facts. It is obvious the State wants to get rid of the problematic house and hand it to the Plovdiv group to the detriment of the heirs of the esteemed Gen. Racho Petrov. The historic property with the house was restored under the law for Reinstating Ownership on Nationalized Properties and was returned to the heirs of Gen. Racho Petrov on January 31, 1996. So far, everything seems unquestionable, while the interests of the owners are protected by the law. However, this did not prevent the Plovdiv-based “Galaxy Property Group” from acquiring in 2006 a document from the court certifying that it had bought the property rights from the municipal company “Sofkniga” that no longer exists. A Decree of the Sofia City Court from March 22, 2006 (President Boyan Balevski), recognizes “Galaxy Property Group’s” property right in the dispute over part of the property and the building of 20 “Dondukov” Blvd..
After a lengthy court saga, “Galaxy” managed to win a case against General Petrov’s heirs for the restituted part, which is 67% of the property’s area. The court accepted that the property had been undoubtedly eligible for restitution, that the heirs are undoubtedly heirs, but because they did not have the originals of the shares at the time, their property could not be given to them. Subsequently, the originals of the shares were found along with the handwritten will of Blagoi Racho Petrov (son of Gen. Racho Petrov and father of the owners). “Galaxy” then attempted to challenge the will with claims to the Prosecutor’s Office, which, however, refused to launch criminal proceedings. The authenticity of the will has been confirmed by court experts. In spite of the newly discovered evidence, the Supreme Court of Cassations refused to reopen the case, as “Sofkniga” (in bankruptcy) had been liquidated and there was no longer another side in the case (as “Galaxy” only intervened as an assisting party). There had been other administrative “miracles” in the case with the “Madara” printing house of Gen. Racho Petrov, as Bivol established. One of them is that the building had been taken out of “Sofkniga’s” balance sheet. By a Decree of the Council of Ministers from October, 1994 the property was taken out of “Sofkniga” and was handed over to the State Enterprise Construction and Restoration which gave the possession of the property to the restitution owners. In the meantime, another Plovdiv company, which has created Sofia’s digital cadaster, accidentally or not failed to include in it the said building. The heirs of Gen. Petrov managed to put the building in the cadaster. Here, the “Sredets” District of the Sofia Municipality stepped in by launching a procedure for the removal of the building, which was considered dangerous. It is important to note that the procedure was carried out only with respect to the General’s heirs: Racho and his sisters – Eleonora and Maria. As early as February 15, 2015, Racho Petrov informed the Sofia Municipality that there is pending litigation over the property because “Galaxy” had filed a lawsuit and claims to be the owner. The decision of the Sofia City Court was issued in August 2017 and it stated that “Galaxy” was indeed the owner. However, the Sofia Municipality failed to take into consideration the pending property dispute and to inform “Galaxy Property Group” about the forthcoming removal of the building. Starting the demolition on an official holiday has another aspect – the Sofia Municipality must pay double work wages – at the expense of the city taxpayers, and in favor of the Plovdiv group. Accidentally or not, the demolition of the building during the Christmas holidays has been tasked to another Plovdiv-based company, “Radiant and Co.”, owned by Plovdiv businessmen Martin Mitev and Dimitar Stoyanov, and a regular winning bidder in Sofia Municipality public tenders, earning to date over BGN 2.5 million. The co-owners of “Galaxy Investment Group” (the new name of “Galaxy Property”) are Anton Shterev and Atanas Petrov. Their visible connection with alcohol manufacturer “Vinprom Peshtera” is through the companies “Solater” (Petrov is the sole owner and the same company is co-owner of “Galaxy”) and Orbias (with Shterev as the sole owner). The property of “VIP Brands International”, as “Vinprom Peshtera” is now called, also includes two Cypriot offshore companies. The two Plovdiv businessmen are not formally associated with the management of “Vinprom Peshtera”, which they left in 2000. According to media reports, Petrov and Shterev also control cigarette producer “Kings Tobacco”, although they are not officially registered as owners. Petrov and Shterev turned infamous in March 2008 in connection with the outrage that led to the resignation of then-Interior Minister Rumen Petkov. The reason was leaks to the media exposing the previously mentioned scandal with a big boss from the Main Directorate for Combating Organized Crime (GDBOP) requesting a luxury rifle and a laptop from a person close to Atanas Petrov. “Peshtera” has harmed the State with over BGN 1.2 billion in unpaid excise duties. The company’s alcohol products’ excise duty labels are printed in the Republic of Turkey. “Peshtera” is the main sponsor of the Bulgarian Socialist Party (BSP), of the election campaign of its candidate for President, Georgi Parvanov, Interior Minister Rumen Petkov and other senior officials. More recently, in 2012, the “Peshtera Boys” appeared in the structure of the privatized tobacco manufacturer Bulgartabac Holding. They participated in the first stage of the privatization scheme with their own capital, separately from banker Tsvetan Vassilev (majority shareholder in the now-collapsed Corporate Commercial Bank, CCB – editor’s note) and (controversial businessman, media mogul, and lawmaker – editor’s note) Delyan Peevski. The information on Shterev and Petrov’s participation in the privatization deal was first revealed in February 2016 when financial journalist Miroslav Ivanov published in his blog correspondence between lawyer Alexander Angelov (known as one of the most trusted people of Delyan Peevski and his right hand man) with banker Tsvetan Vassilev. It provides in writing plenty of detail about Bulgartabac’s “Liechtenstein” and “Dubai” structure. According to Angelov’s letters, the main shareholders, set to participate in the privatization scheme of the Holding, were hidden through several levels of offshore companies. The planned final beneficiaries were Delyan Peevski, his mother Irena Krasteva, Tsvetan Vassilev and the owners of “Kings Tobacco”. As it turned out later, Vassilev and the “Peshtera Boys” had been eliminated as shareholders and their place was occupied by the Peevski group. All this was confirmed verbatim by Tsvetan Vassilev, himself, in a TV interview. Documents, shown by Tsvetan Vassilev during this interview, revealed that Atanas Petrov and Anton Shterev were co-owners with Irena Krusteva in the Liechtenstein company “Asta Cargo” which was about to bid for the privatization of the Bulgarian Railway Company’s “Freight Transport” division. However, the privatization of this State-owned company was later cancelled. According to the banker, who lives in exile in Belgrade, the same ownership structure had been used in the privatization of the Bulgartabac tobacco holding company in 2012. The participation of the “Peshtera Boys” in this scheme is sufficient grounds to be guaranteed immunity by the prosecution and the government, as well as some “small” gifts from the institutions, such as lucrative properties in downtown Sofia. With guaranteed media comfort.